CONFIDENCE HAS A NEW LOOK AND FEEL it’s like perfect feel in putting, just 1,000 yeards long. The new Tour V2 with Pinseeker laser rangefinders rests in your hand with an ergonomic precision that boilds confidence and pride. Its guts are 100% Bushnell laser rangefinder, but the package outside will rival your favorite driver with a custom high-tak grip. The new V2 sets a new standard in the complete laser rangefinder package -looks, feel and performance. A package that may see players starting to waggle their V2 before the range with their targets.The world’s smallest, most advanced laser rangefinder, the Bushnell Tour V2 weighs just 6.6 ounces and is accurate from 5 to 1000 yards. It’s equipped with PinSeeker technology to combine pinpoint accuracy and consistency enabling you to range up to 300 yards (±1 yard) to the flag without the use of reflectors. Designed exclusively with the bottom of the cup in mind, Bushnell’s Pinseeker mode allows easy acquisition of the flag without inadvertently capturing background target distances. When more than one object is acquired, the closer of the two objects is shown on the LCD screen. Powered by a 3-volt battery, the ultra-compact Tour V2 boasts a 5x magnification and features a rubber armoring, making it easy to grip. It also comes with a premium carrying case. The Tour V2 is legal for tournament play and for posting of scores for handicap purposes. 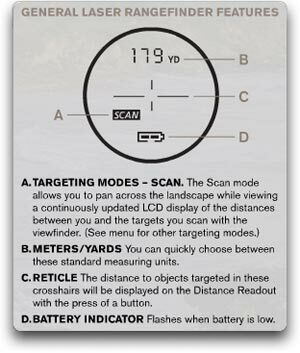 Other features include distance readings in both yards and meters and standard SCAN mode, which allows you to pan across the landscape while viewing a continuously updated LCD display of the distances between you and the targets you scan..
Bushnell’s Yardage Pro rangefinders use an invisible, eye-safe Class 1 Laser beam (as classified by the FDA) which is “bounced” off distant objects with the press of a button. Then, the rangefinder’s high-speed digital clock measures the time it took for a laser beam to reach a target and return to the unit. Next, using advanced digital electronics, the rangefinder instantly calculates the distance within ±1 yard and shows the range in either yards or meters on a through-the-lens LCD Display. The entire process is so fast that less than a second elapses between the time you press the button to generate a laser beam to the time the exact range to your target is displayed.